to measure soil conductivities and EM responses for metal detection. Geonics electromagnetic instruments for geophysical surveys fall in to two general categories, time domain EM (TDEM) and frequency domain EM (FDEM). Geonics EM31, EM34, and EM38 systems measure the terrain conductivity, inphase response, and magnetic susceptibility of rock, soil, fill, pore fluids, and metal using FDEM. Geonics builds two types of TDEM systems, the EM61 and the Protem receiver. The receiver needs to be paired up with one of the time domain transmitters (EM47, EM57, or EM67). The Protem is for deeper earth exploration, while the EM61 is for metal detection and has a limited depth of penetration. Follow this link to rent equipment from K.D.Jones Instruments. (The above is the same as Geonics EM-31, EM-34, EM-38, EM-47, EM-57, and EM-67). For help today, fill out GeonicsRental.com’s form. Scroll down to skip over the form or go to the bottom of this page and leave a comment for someone to help you find an answer about vibration monitoring equipment. We will respond. suited for electrically conductive environments then electrical resistivity methods. Compared to EM methods in general, currently available electrical resistivity systems are often capable of producing more detailed cross-sections or psuedosections utilizing multi-electrode resistivity arrays or towed capacitance coupled resistivity arrays. 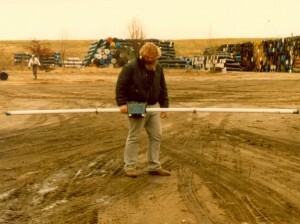 Go to EarthResistivity.com to rent electrical resistivity equipment. Because ground penetrating radar transmits and receives electromagnetic signals it is sometimes grouped in the electromagnetic instruments. However, the way GPR uses electromagnetic signals is very different than the instruments discussed in the page. 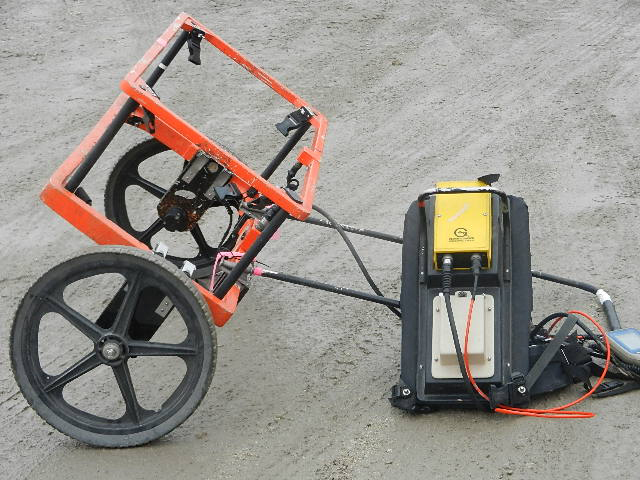 With the right site conditions, GPR can produce detailed images of the subsurface. Follow this link to find out more about GPR. Please fill this form out to contact us. Here are a few posts. How can I map soils by pipelines for cathodic protection. There are several geophysical methods for characterizing soils along a utility corridor, as we discussed over the telephone. Since you are focused on cathodic protection, electrical methods are likely a good choice. If the soils you are trying to characterize also have a good contrast in “stiffness”, multi-channel analysis of surface waves MASW could possibly assist. Geonics EM-38, EM-31 Short, EM-31, and EM-34 are terrain conductivity meters that measure apparent soil conductivity. The depth of penetration ranges from a few feet to about 200 feet. The EM-38 and EM-31’s collect data much faster than an EM-34. While changing the elevation of the instrument or the orientation can change the depth of penetration, it usually takes multiple instruments to cover a wide range of depths. The instruments are also very sensitive to nearby metal and possibly to noise from electrical power lines. Electrical resistivity methods, depending on the orientation of the array, are often less sensitive to metal. A Geometrics OhmMapper acquires data at approximately the same rates as the EM-38 and EM-31’s. Depth of penetration is varied by changing the geometry of the dipole-dipole array. There are an infinite number of possibilities. Based on my experience, it may be challenging to obtain depths greater than 50 feet. 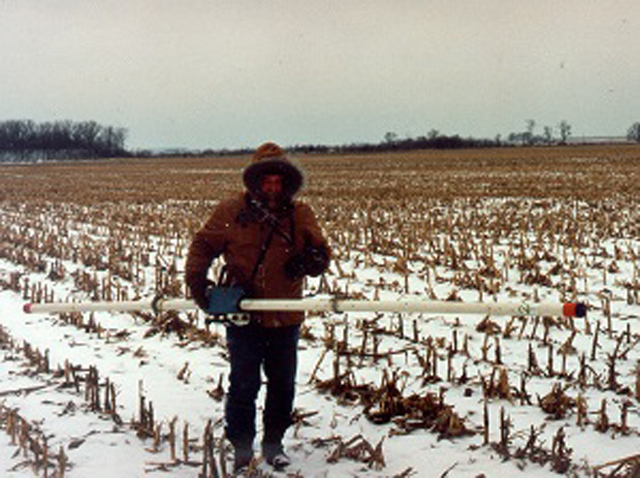 The above geophysical instrumentation is some of the best for mapping large areas (e.g., 100’s or 1000’s of acres and/or miles of line). Some of the greatest detail along a line would be obtained with a multi-electrode earth resistivity survey using an AGI SuperSting R8. The greatest detail, given good soil conditions, would be from ground penetrating radar GPR. However, these last two geophysical methods can be slow going. 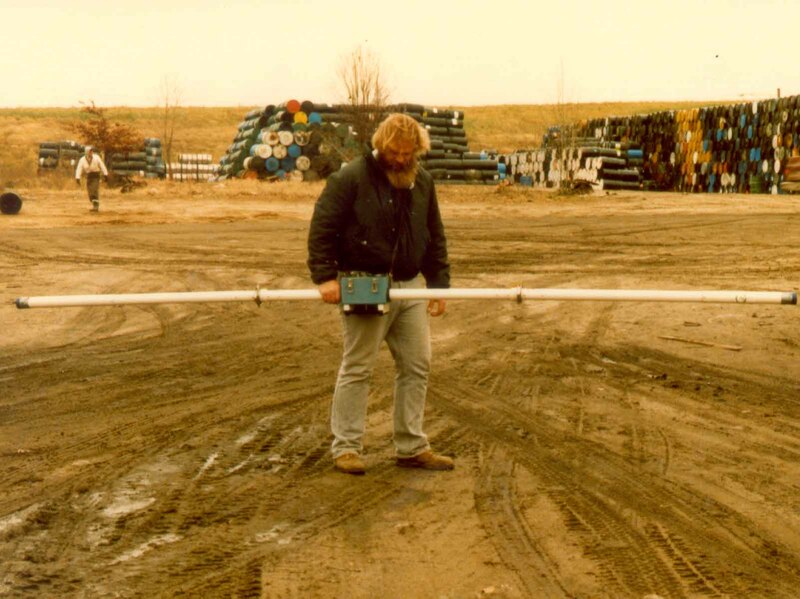 The EM34-3 (and, to a lesser extent, the EM31-MK2) is often used for cathodic protection surveys. A lot of ground can be covered quite quickly to map lateral changes, and some – usually enough – vertical resolution can be obtained by using an expanding setup: 10m, 20m and 40m coil spacings on a common centre, vertical and horizontal magnetic dipole readings at each spacing. The instruments will see metallic pipes, but only when they are relatively close. For the most part, you will be able to rapidly map the terrain conductivity over a wide area. I don’t necessarily recommend replacing resistivity surveying with EMI, but rather using it as a complement. As noted in the original response, data from the Supersting is excellent, but data collection is slow. The EM34 has less resolution, but can cover a large area in a very short time. Use the EM34 first and use the results to plan Supersting survey lines and you have the best of both worlds and the lowest total survey time and cost. I was told that my grandfather buried a suitcase on the property with civil war swords. what kind of equipment do I need to find it. Many geophysical instruments are available. Geonics EM-31, EM-38, and EM-61 are very good at locating buried metal. The EM-31 and EM-61 have a greater depth of penetration then the EM-38. Geonics EM-31 and EM-38 are terrain conductivity meters and measure soil conductivities, but, are also sensitive to buried metal. The EM-61, which is sensitive to primarily buried metal, may be more difficult to operate in rough terrain or wooded areas since it is often setup as a wheeled pull cart. Geophysically, the greatest depth of penetration for buried iron (the type a magnet sticks to) would be achieved with a magnetometer (e.g., a Geometrics G-858). However, the greater the depth of burial the more iron you will need at a location. The EM-38 and the magnetometer are likely the most portable. While the above geophysical instruments do not provide the greatest detail they are good at detecting metal. The greatest detail is often observed with ground penetrating radar GPR. GPR can be difficult to operate over rough terrain and wooded areas. Desirable GPR results are strongly dependent on soil conditions, water, and other near surface metal. You may want to take a phased approach to the geophysical surveys and try some of the less expensive geophysical instruments first. I would like to collect electromagnetic conductivity EC data for agricultural purposes on approximately 5,000 acres. Geonics EM-38 and Geonics EM-31 are being used for agricultural purposes. You can cover large areas with these geophysical instruments. The EM-38 is for the upper few feet or so while the EM-31 can reach depths of penetration up to about 15 to 20 feet. Are you looking to map variations in clay content? I recently had a person contact me because they wanted to remove near surface clean sand and gravel rich areas that were drought sensitive. The drainage was too good. After mining the sand and gravel, they were then going to recover these areas with stock piled soils that were collected from other parts of their land. For them, having a better soil composition across the farm field was the primary objective. Other farmers and agricultural engineers are documenting the soil conditions on a yearly basis using geophysical methods. Changes in soil conditions are then correlated with crop yields. Soil tests are then often taken in both the bad and good regions. This type of monitoring can assist a farmer, agricultural engineer, or investor to better understand the field conditions. Field conditions are then adjusted based on the geophysical data and other analytical results. 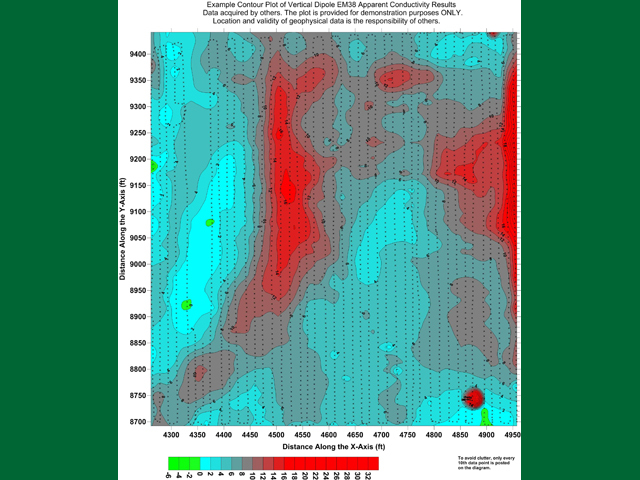 There are a couple of good papers on agricultural geophysics. Let me know if you are interested. Want to rent a Geonics EM-38. Have a sponsored research project to map sea ice in Alaska. It will be interesting to see how the Geonics EM-38 geophysically characterizes the ice. Please update us at GeonicsRental.com when you find out more. Call to rent Geonics equipment. While Geonics EM-31, EM-38, and EM-61 are all good for geophysically mapping buried metal and near surface soil conditions they respond differently to different geologic conditions. Please be aware that there are treasure hunters and get rich schemes that often try to hire people like yourself. Research the geology and the investors funding the project to confirm the legitimacy of the claim. Reply to this post if you wish further assistance. I would like to delineate the extent of buried demolition debris, wood, roofing, asphalt, concrete, etc. in a yard covering about 1 acre and a depth up to 10 or 15 feet below grade. Which EM method would be best suited? You need geophysical equipment and followed up with a call. Per our discussion, you do not have many choices. Ground penetrating radar offers some of the greatest resolution but it may not provide the most cost effective approach for geophysically surveying an acre. GPR may be a good second method for confirming the EM results or for adding greater definition. Assuming there is an electrical contrast between the undisturbed soils and the fill material, a Geonics EM31 may be a good choice. Since the fill is more or less from the surface down to about 15 feet a regular or normal EM-31 or an EM31 short may work for you. However, the normal EM31 will provide great penetration, which you may need if you have a significant amount of cover. If enough metal is associated with the fill, a Geonics EM-61 may also yield nearly the same results; however the outcome would be based on mapping the extent of near surface buried metal. This doesn’t cover all the details but hopefully it will help get started with your geophysical investigation.